Always my bourbon of choice. It may not be a national holiday (it should be, by the way) and it might not show up on your August calendar, but it’s solidified a place on mine. My friends, Kate, and Brandon, have been hosting the themed soiree for three years, each one being bigger than the previous. Making it to their house on the early side ensures a good look at how the two of them work so well together, in and out of the kitchen, to pull off a party worthy of coverage in Food & Wine magazine. Highlights of the evening include tastings of both bourbon and beer and a menu of food prepared with each. Their beautiful backyard completes the theme and makes the perfect setting, with a bonfire on the patio and plenty of games in the grass to occupy the little ones. Kate and Brandon always provide more than enough food and drinks but, like good guest, I wanted to bring something to lessen their load. 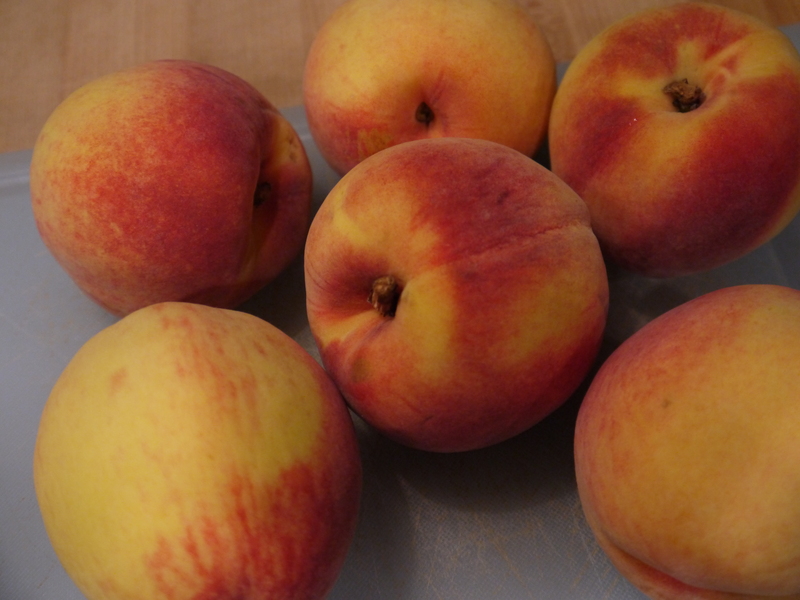 This recipe incorporates bourbon with the last of summer’s sweet peaches. For the crust, pulse together flour, sugar and salt in a food processor until incorporated. Add butter to machine and blend until dough forms a ball, slowly incorporating ice water. Remove from processor and mold into a flattened disk. Wrap in plastic wrap and refrigerate for at least one hour. Preheat oven to 350 degrees and remove dough from refrigerator. Combine all filling ingredients in a large bowl, gently mixing so that all ingredients are incorporated, and set aside. Make the topping by combining the dry ingredients in a medium bowl and mixing the butter in with fingers. Drizzle with bourbon and toss to combine, so that mixture resembles crumbs. Set aside. Roll out the dough into a circle onto a floured work surface and place in a 9” pie dish; trim the edges and crimp with the edge of a fork or pinch with your fingers. Pour filling into prepared crust and top with crumbled butter topping. Bake in oven for 45 minutes to 1 hour, checking towards the end, until crust is browned and filling is bubbling. This is probably the least intimidating recipe on the spectrum of pies; the dependency on the food processor is integral in its success. Why bother using your hands to make the dough when the machine mixes everything together perfectly and without the mess. Let’s not forget to assess, too, that it’s a single crust recipe – meaning I altogether avoided the intimidating factor of making a pie lattice to cover the filling, opting instead for a way more flavorful, crumble topping. The easy filling is the perfect blend of sweet, tart summer peaches and corresponding pie spices, like cinnamon and nutmeg. You could mess with the proportions depending on what you prefer, or add thinks like ground cloves or allspice. 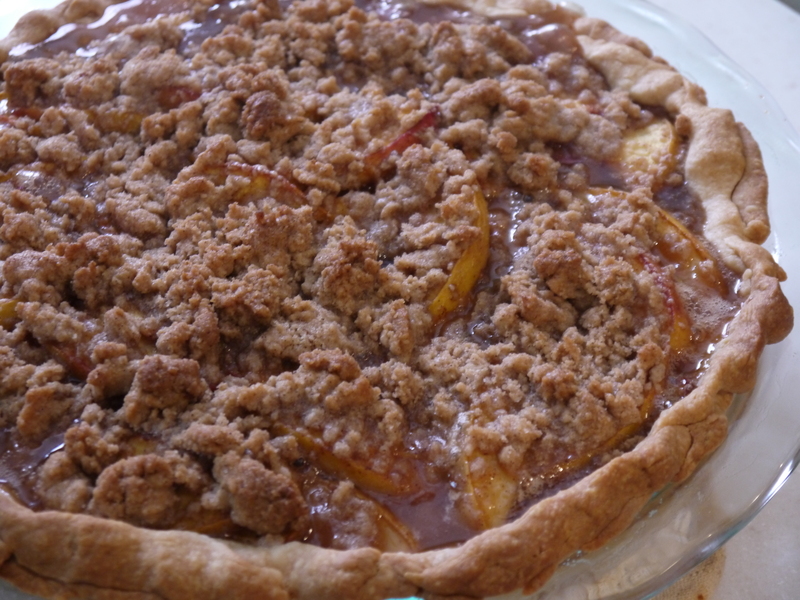 The natural sugars in the fruit melt with the white and brown sugars, softening the peaches and creating a thick, sweet filling that’s anything but runny by the time the pie is ready to serve. On the rare occasion I make myself a cocktail at home or order one at a nice bar, I tend to sway towards bourbon based drinks. The golden color is so rich and appealing, and I love its toasty flavor profile, with hints of vanilla, caramel and sometimes molasses – the characteristics that make it so perfect for baking and cooking. 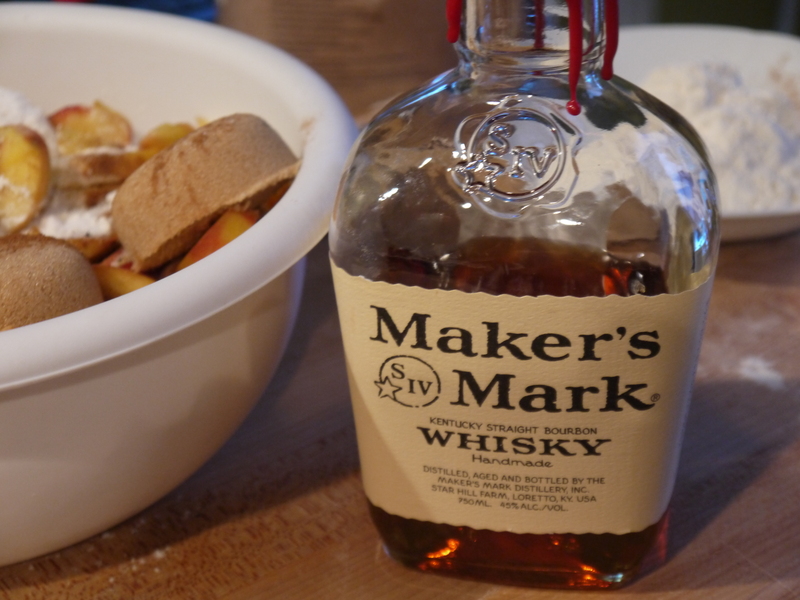 It’s not as apparent in the pie filling as in the slightly crunchy, buttery topping, but the last of the summer’s ripe peaches, combined with the cinnamon, brown sugar bring out the best in bourbon’s natural flavors. If you wanted to attempt and alcohol-free version, you can simply substitute a smaller amount of vanilla extract in place of the bourbon. Just like this pie, the third annual Beer, Bourbon and Barbecue party was such a hit that I’m already looking forward to next year. Thankfully, I have a handful of calendar holidays to hold me over until then.